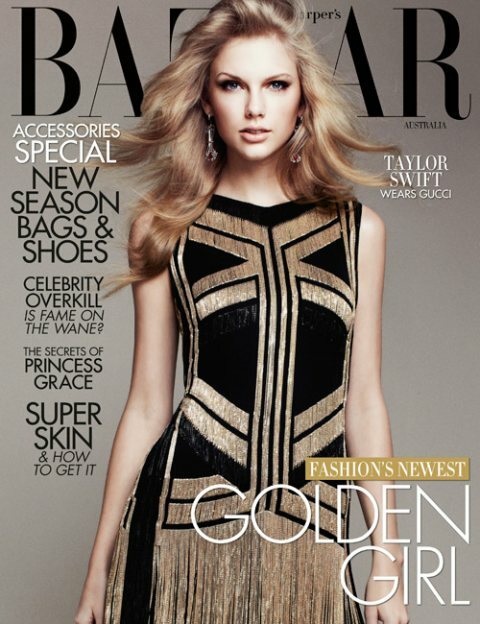 Taylor Swift, Hollywood's "it" country girl, covers the April Issue of Harpers Bazaar Australia as the "Golden Girl". She wears a beautiful gold and black Gucci dress (worth $10 000) that goes perfectly with her golden locks and porcelain skin. The shoot definitely shows us that she has a different side to her fashion wise in contrast to the conservative style she tends to show on the red carpet. She takes fashion risks in wearing tattoo sleeves, edgy leather jacket by Tom Ford and a fabulous wrap by non other than Kanye West. No comments yet on Taylor Swift Covers Harper's Bazaar Australia .